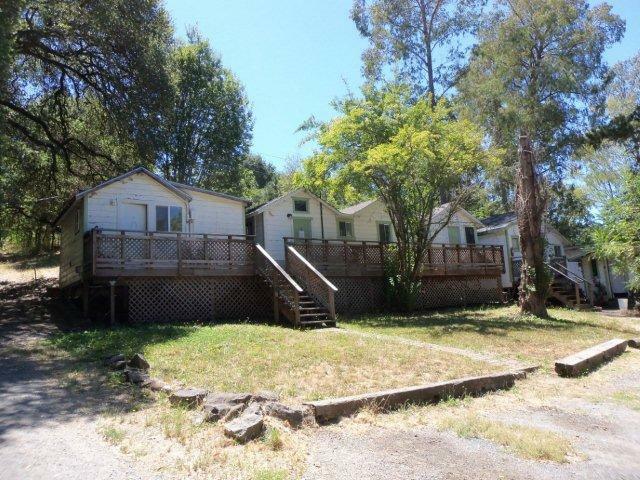 On the About Us page of this website, I mentioned in passing that my husband Kelly and I had lived at Sunshine Camp in Forestville, CA, in an intentional community with other family members. I don’t know why I happened to mention it, but that brief reference led to a fascinating communication. I do love how the internet brings people together! In the 1930s my grandfather’s cousin (Rev. Charles Philipps) was the Catholic priest and pastor of Saint Sebastian’s in Sebastopol. Somewhere during that time he obtained via foreclosure the property that became Sunshine Camp. From the 1930s to 1958 he ran the camp and each summer would bring children from the poorer areas of Oakland and San Francisco for camps on the Russian River. After he died in 1958 the Catholic Church kept the camp going until the early 1970s. At that point the land was sold. From your site’s information it sounds as if you were living there for seven years shortly after that. In the last few years I have made contact with this priest’s relatives in France and they are coming for their first visit this September. They had some pictures from Sunshine Camp (very rustic looking accommodations) and would like to go and see it while they are here. Just as interesting to me was further information that Dan sent us from a book called The Radical Peasant by Gerald F. Cox, about Father Philipps, or Charlie as he was widely called. Evidently he was a very colorful and dedicated man. I’ve just ordered that book from Amazon to find out more. Nice to think that the place where we had so much fun had been started by someone with such dedication and flair! I got the book at Amazon, and it’s a labor of love by a priest who knew Charlie well. Hi Dan! Nice to hear from you. I live in New Mexico now and don’t have access to Sunshine Camp! Penny didn’t leave an email we could try. But I know that when we lived there people did come by to see the place and we welcomed them. You might get a friendly welcome if you tried the same thing. I had not looked at this site for a few years and am happy to see that you still get postings from people. I’d like to go there again and see the place but not intruide into people’s lives. Can you get me in contact with Penny Hamilton who posted in August and is living on the property. Maybe I can connect with her. P. S. Author Jerry Cox passed away earlier this year. So glad to hear you are living at Sunshine Camp as the last I knew, several years ago, it wasn’t in use. I have a vague memory that the big house (as we called it too) was built in the 1860s but that could easily be wrong. Suggest you go to one of the larger public libraries in Sonoma County and ask for help. They have some historical resources, I remember from when I was a librarian there. I am currently living in Sunshine Camp in the cabin on the left.2018 & it is still a lovely community! I love learning about the history of this place & the people who lived here. The chapel with it’s beautiful stained glass window is still intact. I’ve also learned that what we call ” the big house” is the oldest farmhouse in Forestville, possibly the oldest building in Forestville!I would love to learn how old it is & the history of this place before Sunshine Camp.Thank you for all the information you have provided here. I SPENT MANY A SUMMER AT SUNSHINE CAMP IN THE 50’S. I WAS A PART OF SAINT MARYS PARISH OF WEST OAKLAND. MANY OF MY SIBLINGS WENT THERE ALSO. IT WAS NICE TO STUMBLE ONTO THIS ARTICLE. I HAVE ALSO FORWARDED IT TO MY SISTER. SUNSHINE CAMP WAS ONE OF THE SETTINGS FOR MY GROWING YOUTH, I WENT INTO THE SERVICE AFTER THAT AND SPENT 23.5 YEARS WITH THE US ARMY SPECIAL FORCES AND RETIRED WITH TREMENDOUS HONOR AND PRIDE. THANKS TO MY MENTORING AT SUNSHINE CAMP AND ALL THE FINE SPONSORS WE HAD AS KIDS. FATHER COX AND FATHER O’ROARK WERE OUR PARRISH PRIESTS AT THAT TIME. Thanks for sharing this, Paul! We bought part of the orchard when we bought part of the camp and we made applesauce and cider galore! I spent several consecutive years as a camper at Camp Sunshine (1954 – 1960). At age 70, I still remember those awesome summers, walking through the redwoods to Mirabel beach park, cattle truck rides to Bodega bay, or skating rink day in Gurneville; every day was unbelievable, especially for kids raised in the confines of a big city. Once, when the camp needed a good cleanup, which we gave it, Father Phillips rewarded us with an ice cream party. We were adept at slipping into the adjacent apple orchards, and eating our fill of green apples. At night, we sang songs and put on skits at the campfire. Our favorite song was: Hooray for Father Phillips, Father Phillips, Father Phillips, he my friend and yours! Thanks for your story, Stephanie! Amused that that was wilderness! going through old box and discovered a postcard I wrote from Sunshine Camp dated June 1965. I was one of those low income kids from inner city Oakland. I recall seminarian Larry Purcell as one of the counselors. It was my first wilderness experience. I have so enjoyed reading these stories. My Mom (Ruth Sharp) was the cook for girls session plus the week before camp opened for 15 years. She cooked for 50-75 people a day depending on weekend visiting “dignitaries” as Pop (Fr.Phillips)had many important friends. She also took care of the infirmary and was general “mom” on call. I remember how hard she worked from early morning to late at night when she would leave a homemade pie on the kitchen table for the counselors. Both my mom and dad (Pete Sharp) were also on the board of directors for the camp for all those years. They always told me that you could never work that hard for money. It had to be for love. I was never allowed to sleep in a cabin with the other girls due to a serious childhood illness but in every other way was a camper. I lined up for all meals, went to campfire and rode in the back of the cattle truck!!! When I was a teenager I graduated to pot washer in the kitchen along with one of the sem’s sisters (Jo Sandersfeld) who was the sister of “Big John” John Sandersfeld. Jim Purtcell remembers his friend Jack McMullin (as B.John)but he was actualy known as “Dumbo” a reference to his ears. He was a great guy who died young and left this earth far too early. My Mom (now 91) still hears from “old” sems like Bob Moran and Jerry Cox each year. I cannot hear “your are my sunshine my only sunshine” without feeling that it is my own personal song. What a great legacy Pop left us . Mae, glad it worked out. I sure had no idea of what all would follow when I blogged about good ol’ Sunshine Camp! Dan Phillips did contact me and was kind enough to accept more info on my experiences to pass on to Gerald Cox who then contacted me. I believe that all three of us have enjoyed sharing each others’ memories. Thank you for making all of this possible. Mae, what fun to read your story! I don’t have Gerald Cox’s contact data but Dan Philipps does and I will email him with your email and ask him to contact you. Thanks for writing! I am so pleased that I discovered this connection. I just finished reading Gerald Cox’s book, and I would love to have his email or postal mail address, so that I can thank him and tell him of my St. Mary’s School and sunshine camp experiences. I found his home phone, but do not want to intrude on his privacy. My Irish mother died when I was 5 years old, and my father moved me, my 1&1/2 year old sister and himself to our Italian grandparents at 4th and Jefferson in 1935. We lived there until my father remarried and we moved to Albany in 1940. I attended St. Mary’s for 4 years, and went to Sunshine Camp 2 or 3 times. The book brought back long forgotten memories. I kept interrupting my husband’s reading to say “OMG listen to this, I remember this”. I also remember Alice Ravel who was in my class. Even my adult life was involved. I taught at Raskob Institute and Sister Eileen was my boss and a great friend of my husband and myself. If you can help me in contacting Gerald Cox, I have more to tell him, and I want to thank him for these revived memories; my husband would never believe me about the cattle truck that took us to camp–now I have proof. Nice to hear from you, Jim. I’m really enjoying how the texture of my own memories of Sunshine Camp is being enriched by these stories. What a treat to read all of this. I was a counselor/seminarian who worked at Sunshine Camp during the summers of 1961 and 1962. I suspect that “Big John” was Fr. Jack McMullin (a seminarian at that time who got me involved). Sunshine camp was the first experience of real community outside of my family for me and it was fantastic. The other cook and her daughter were probably Peggy and her daughter, Marilyn. I am still in touch with Jerry Cox and his book on Fr. Philips is terrific. Thank you so much for sharing your memories! I grew up in Maryland, and the one time that I went to summer camp remains a highlight of my childhood memories too! I was interested in your comment about the cabins to the right being the seminarians’ as I had wondered where they slept. When we lived in the camp, that row of cabins were the rooms of the part my husband Kelly and I lived in. The one on the far left was my pottery cabin and getaway place. The next one we used for storage, and Kelly built shelves into it. Then came our guest room, and during the summers that Kelly’s daughter lived with us, it was her room. Then Kelly had his music-and-art studio, and the last one was our bedroom. We added a bathroom to it. Then, down a few stairs from our bedroom was a slightly larger cabin which was our combined living room, dining room, and kitchen. I am guessing that was a seminarian’s bunkhouse when you were there. Right next to it was a much larger building with a wonderful pear tree in front of it. My two sisters-in-law who lived there had a weaving studio in it, which they shared with their weaving students at times. Oh boy, I could go on and on! Please tell your friends about this page. We will never meet in person but we have a real connection! I am so pleased to see this page. 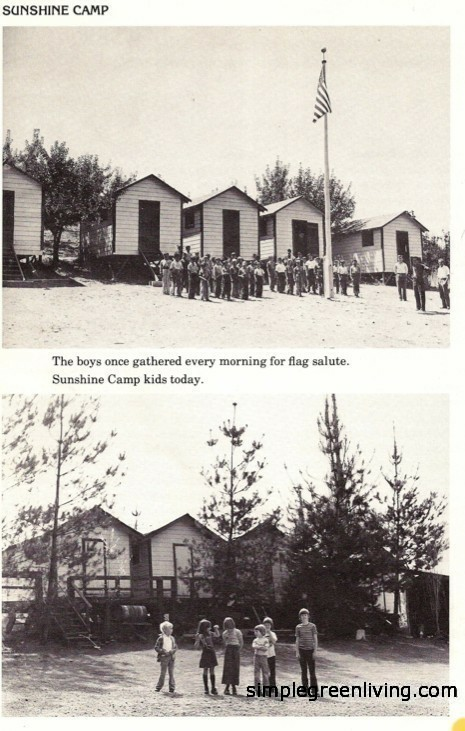 I was one of those fortunate children that went to Sunshine Camp in Forestville, CA. My parents had ten children, and three of us were invited to attend this Camp. We lived in Mt. Eden, Ca which is now part of Hayward, CA. This was part of the San Francisco Archdiocese. I believe it was in 1953. There were a bunch of girls from different parts of the East Bay, Oakland, Baumberg, Russel City, and Hayward. We would go for two weeks. The summer camp was alternated, two weeks all girls, and two weeks all boys. The pictures above were the cabins we stayed in. To the right were the cabins for the counselors which were seminarians. I remember just a few names, Richard Duenes, Bob MacEntee, and Big John. The cooks were Phoebe and another woman who had a young daughter with her. Our day would begin with saluting the flag, mass and then breakfast. After that we would all walk over to the river and spend the rest of the day playing in the water. The first night, we all got sunburned and I clearly remember hearing everyone crying, including myself! Father would hear our confessions also. If there was a dispute between girls, Fr. would have the girls involved get in the ring with boxing gloves and believe me after that, they would be friends. By the end of the two weeks we were all good friends and cried that we would be going home. I am grateful for Sunshine Camp since poverty did not provide for many luxuries. L. Hernandez, Martinez at that time. Thanks, Dan! Readers, to get to his webpage about Charles, just click on Dan’s name above his comment. To learn more about Charles visit my web site. 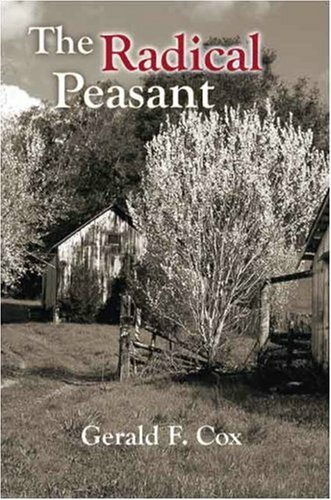 If you read the book “The Radical Peasant” by Gerry Cox you will learn of a man who wasn’t afraid to speak his mind to the hierarchy of the Catholic Church, who cared for the people and especially cared for poor. 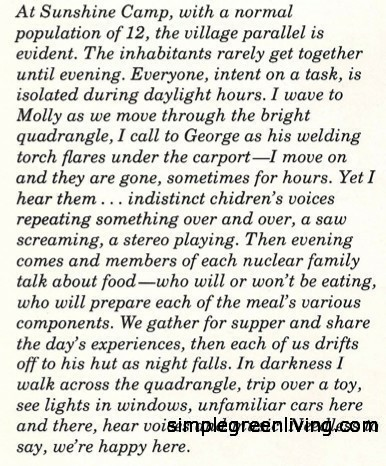 To me it is an uplifting experience to read it. He strongly believed in smaller family farms and not super large pesticide filled commercial agricultural farming. I believe our health, the bee population and nutrition would be much better if his ways had been followed. But fortunately I see us turning more and more to natural and organic growing methods.